On 7 April 2017, Gurney Plaza held their opening night of the Fashion Showcase which took place from 7 to 9 April 2017. This Fashion Showcase was for their Fashion Month 2017 which will last their whole month of April 2017. 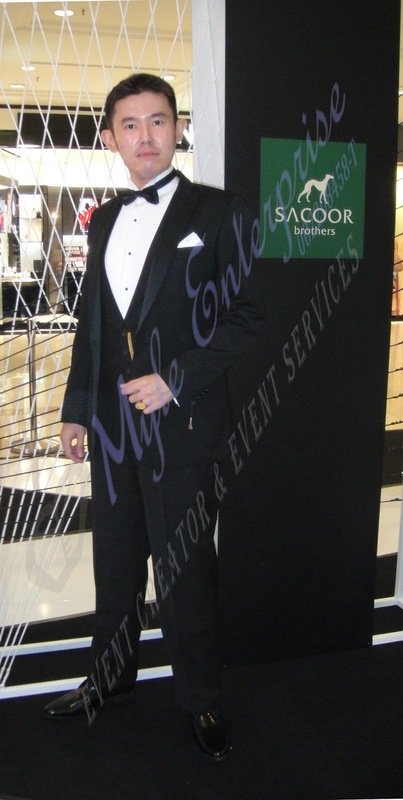 Sacoor Brothers proudly held their Fashion Show during the opening night, with their show being the one and only catwalk for the night. The event saw many well-known faces in the fashion industry in Penang, Malaysia. Those seen at this event were the personnels of Sacoor Brothers, the management of the mall who are no stranger to the fashion world as they deal with many tenants involved in the fashion industry, designers, celebrities, owners of modelling agencies, models and of course, there are the event related personnels for example photographers who have extensive portfolios which includes fashion shoots. Fans of fashion came to view this event. We are honoured to be invited by Sacoor Brothers and also the management of Gurney Plaza Mall to attend their opening night of their Fashion Month. The mall’s concourse area or Central Atrium, as they call it, was set up for the fashion show. Gurney Plaza take pride in calling themselves the “Premier Lifestyle Mall”. The event began with the registration of guests. The management team of the mall as well as the management team of Sacoor Brothers were seen greeting their VIPs and guests for the night. The event area at Gurney Plaza’s Central Atrium. The guests were ushered into the cordoned-off Central Atrium and seated on the ground floor of the mall. Announcements were made to signal that the fashion show was about to begin. Then, celebrity emcee, Nadia Heng, came on stage to welcome the guests to this fashionable event. She was looking elegantly professional, wearing a Sacoor Brother’s blue dress. If you want a glimpse of her in that dress, check out our video at the end of this blog. After that, the fashion show began. Sacoor Brothers showcased their latest collection at the fashion show which opens the Fashion Month 2017 for Gurney Plaza. Let the catwalk begin. One of the looks from the Sacoor Brothers collection 2017. 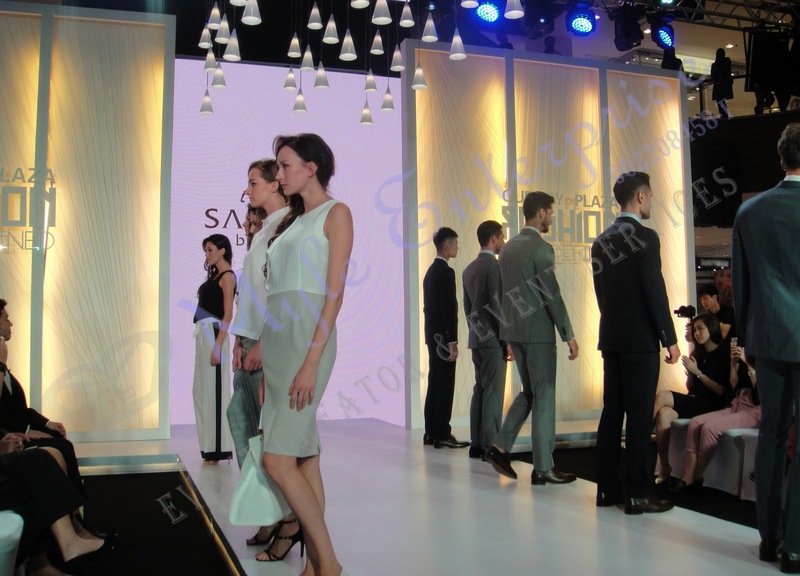 The Sacoor Brothers Fashion Show during Gurney Plaza’s Fashion Month 2017. VIPs and guests concentrating on the Sacoor Brothers Fashion Show during Gurney Plaza’s Fashion Month 2017. The emcee, Nadia, came on stage again after the fashion show and told the guests that it was time for a lucky draw session. Gurney Plaza‘s Centre Manager came on stage to give out the prizes to the lucky winners. After that, it was the end of the opening show for the Fashion Month. 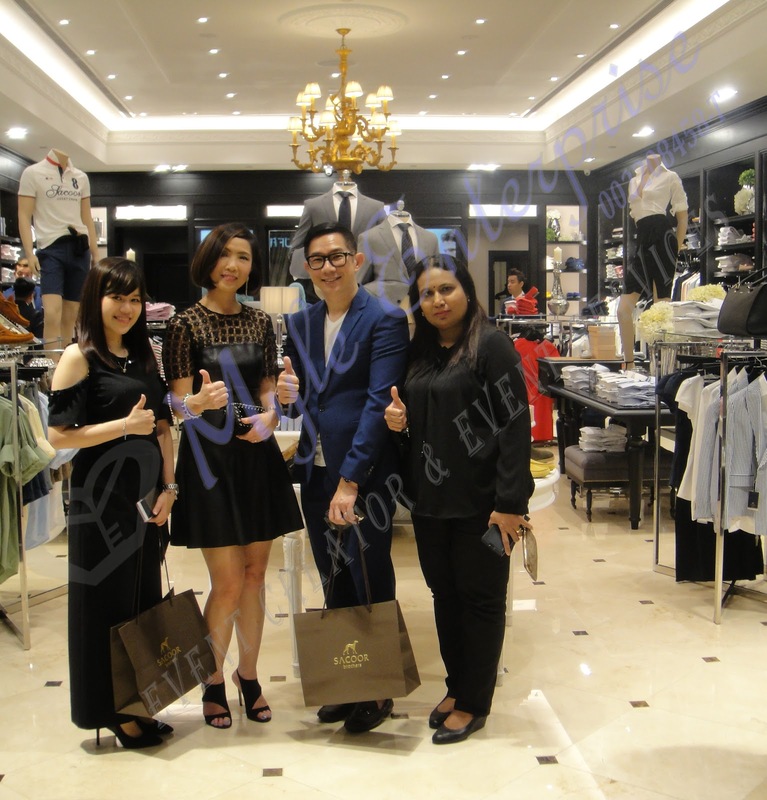 VIPs and guests were then invited to Sacoor Brother’s store at Gurney Plaza for an after-party with refreshments. Guests made their way to the store. At Sacoor Brothers’ store, displays of clothes, shoes and accessories with a hanging chandelier in the store greeted the VIPs and guests. 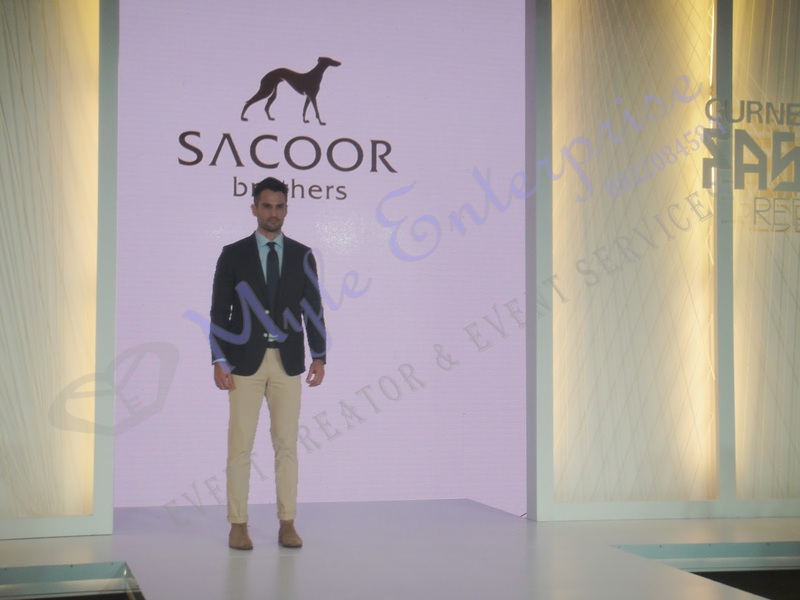 Guests were seen chatting with each other while admiring the latest collection from Sacoor Brothers. Some were browsing through the displays and busy picking out clothes to buy. 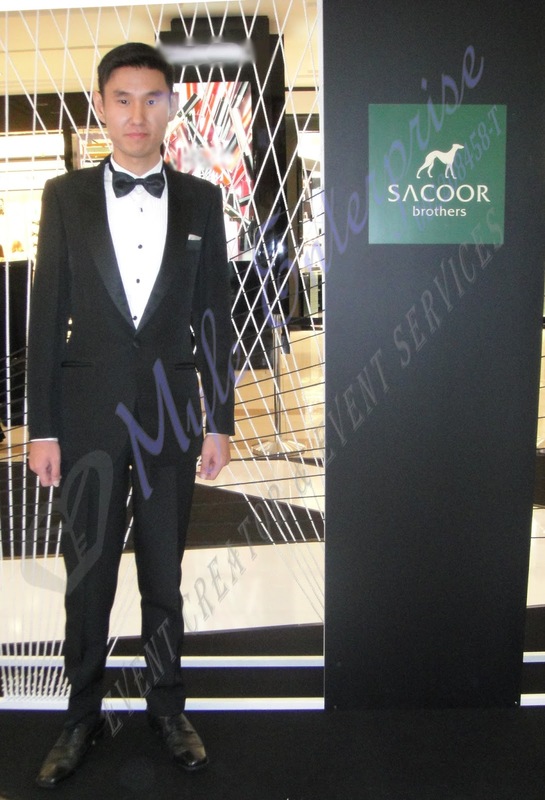 The team at Sacoor Brothers were professionally attending to the guests’ requests as well as ensuring the store were neatly kept. Champagne flutes with bubblies in it were carried around to be served to the VIPs and guests. There were choices of red wine and non-alcoholic beverages served as well. The guests mingled around and by about 9pm, most guests have left. The evening has been wonderful and guests left on a cheerful note. Guests from the management of Gurney Plaza and CapitaLand Malaysia Mall Trust attending the after-party at Sacoor Brothers. A group picture of the team from Sacoor Brothers after the after-party at Sacoor Brothers. A closer view of the group picture of the team from Sacoor Brothers after the after-party at Sacoor Brothers. We leave you now with a video taken during the opening night of the Fashion Redefined @ Gurney Plaza, showcasing Sacoor Brother’s Fashion Show and the after-party at their store. In case the video does not load below, this is the link to the video : https://youtu.be/51Gb-sNguhs. Gurney Plaza’s Fashion Month 2017 lasts the whole month of April 2017 and there will be great deals as well as discounts throughout the mall. Do drop by Sacoor Brothers while you are there and fall in love with their latest collection, then take home a piece or two for yourself. On 25 March 2017, InterNations Penang held an event so that their members can gather together for a night out. This event was held at one of the restaurants in Pulau Tikus on the Penang island. Some new members joined them for the first time. There were also guests present that night who so happened to chance upon the group gathering and joined in the event. The members registered for the event which was supposed to be at 7pm that night. By 7pm there were already a lot of people at the venue which was situated on the second floor of the restaurant and this section was specially closed off for this event. There was also a raffles draw that night. Many members paid Ringgit Malaysia 5.00 for the raffles ticket in the hope of winning a bottle of wine to take home that night. Some of the InterNations Penang members. Most of the members enjoyed the drinking promotion offered that night which they called it the “drinks buffet” where guests can drink as much alcohol that were displayed at the buffet table as they want by paying a flat rate amount. Some guests who wanted to have dinner can sit in the closed-door dining room while waiting to be served. The lovely ladies having their meal in the dining room. Most guests were seen interacting with each other. Some of them have met each other during previous events held by this same group of InterNations Penang. Apparently there are a few different event organising groups in InterNations Penang. Members can choose to attend events of their liking or have activities that are based on their interest. Guests who are first-timers to events held by this group were free to mingle around and network with the other guests. The organiser, Simon, with his guests. This couple just came for a visit and they are looking to stay long term in Penang. Dartboards were also available so those who would like a round or two of dartgames could play. Some guests were seen playing darts while others gather around to watch them play. The organiser and guests enjoying a game of darts. Meanwhile, the dining room were filling up and all the tables were taken up after a while. Food and drinks were sent in round after rounds. Excited but decently toned down chatters were heard around the tables while some enjoyed their food quietly. The friendly ladies in the dining room. The sweet ladies having their meal in the dining room. A union of food, drinks and friends were seen at this event. Happy faces were seen at this event. The raffles draw took place and a random number was generated using the mobile phone of one of the organisers, Simon. When the number was called out, the lucky winner waved his raffles ticket and the other guests all clapped happily for him. One of the guests were called upon to give out the prize to the winner. There must, of course, be a photo session during the prize giveaway. The winner of the first raffles draw, Norris(right) seen here with Chris(middle) and the organiser, Simon(left). Chris looked excited giving out the prize, he is a winner already with that look. On to the next bottle of wine to be given away. The number was generated and the prize was given away to the next lucky winner. Then the third lucky winner claimed her prize and we were on to the last bottle of wine to be given away. Everyone waited excitedly while the number was generated and announced to the crowd. The final winner smiled happily while she claimed her bottle of wine. One of the winners of the raffles draw. That concludes the end of the raffles draw. The organiser thanked the guests for coming that night. After that, the dance floor was opened and guests could dance to some upbeat music a la latin style or mingle some more with other guests. Most guests stayed on for a while more to talk to others while some finished up their food and drinks in hand. Simon spending some time with his guests. More expats came and joined in this event. Some guests were seen dancing away while others gathered around to watch. Guests were seen swaying and turning to the upbeat music. One of the beautiful guests who were dancing that night. We were told she is a professional dancer. All in all, it was a memorable night. Drinks, food, wine, activities and most importantly, meeting people be it new contacts or old friends – that is helpful when you are in a foreign country which is not your hometown especially when you are new to the place. The saying “no man is an island” would ring true for this case and talking about island, welcome to Penang for those who have been in the state for just a short while or considering to stay in Penang for long term. Some of those attending this event told us that they have been in Penang for ten, twenty years or more. To those, we hope you have found your home away from home and perhaps you might call Penang your home. We leave you here with a video we made on the event that night. Enjoy watching. In case the video below does not load, this is the link to the video : https://youtu.be/Hy3n1xljse4.